It may be difficult to imagine that your office toilet is the dirtiest place you visit every day: there’s no obvious clogging, or stains, or dirt tracks – so just how dirty can it be? To get an idea, just count the number of times a day you visit the washroom, and multiply that by the number of people in your office. It’s probably much dirtier than you think, which is why regularly cleaning it (we’re talking twice a day) is essential. First, consider the many parts of the toilet that you’d touch after doing your business, but before washing your hands: the flush, the toilet stall doorknob, the faucet handle – all these are hotbeds for germs. Even something as harmless as the flu virus can survive for up to 24 hours on hard surfaces, not to mention more dangerous germs like flesh-eating bacteria. The seat is also often filled with germs, and certain gastrointestinal viruses (culprits of food poisoning) have been found contaminating surfaces like toilet seats for up to two weeks. If you’re not careful, the end of someone’s diarrhea can become the start of yours. We wouldn’t recommend that. Sinks are also terrible culprits, with the lingering water droplets after each wash providing an ideal damp environment for bacteria to fester. Nobody in their right mind dries the sink after each use, and you shouldn’t be expected to do that – but a sink that’s even a little wet allows germs to stay and breed. Even the air in the toilet is contaminated, as germs in stools can be launched into the air with water droplets as the bowl is flushed. For this reason, a thorough toilet cleaning must include air-spraying to disinfect the entire environment. Of course, you can take measures to minimize your risk of infection – washing your hands is a good start. Scrub thoroughly with soap, including the back of your hands and underneath your fingernails, for at least 20 seconds. Refrain from touching your eyes, nose, mouth, or any part of your face while you’re in the toilet. If you’re sick, stay home. The bad news is that no matter how diligent you are – washing your hands thoroughly, touching the doorknob with a handkerchief, pressing the flush with your shoe – the whole toilet is as dirty, and as infected, as the least hygienic user. We’re not saying your colleagues are filthy, but simple statistics say that the larger the office, the worse your odds are of catching something undesirable: that’s how “flu bugs” tend to spread. And unless you want to pick up a cloth and personally wipe down each porcelain throne, we suggest you leave it to the professionals. After wiping, those germs won't go away on their own. What Can Professional Cleaners Do? 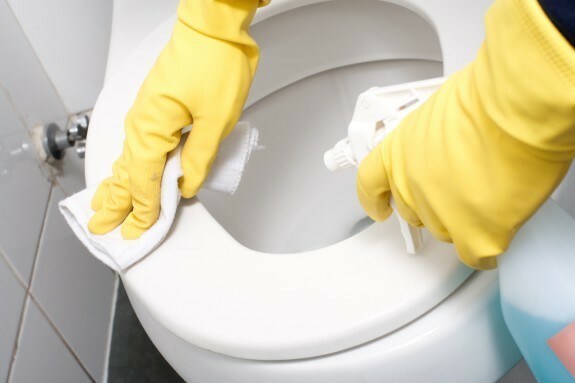 Professionally-trained cleaners thoroughly scrub down each toilet. Thin-bristled brushes should be used to clean off dirt particles too small to be seen, since you never know where germs can be hiding. After brushing, the interior is flushed with disinfectants (including bleach), killing germs and flushing them away. Lastly, the seat is wiped clean with sanitizer and other chemicals, making it pearly-white and more importantly, clean and safe to use. The same thing is done with the sinks, another breeding ground for bacteria. Each sink is thoroughly scrubbed with chemicals, and thoroughly dried after use to prevent germs from sticking around. This also has the beneficial side-effect of preventing metal parts like the drainage cover from oxidizing (turning green). All hard surfaces are thoroughly wiped-down with sanitizer: the flush, the plastic door-knobs, the faucets, the counter-tops. 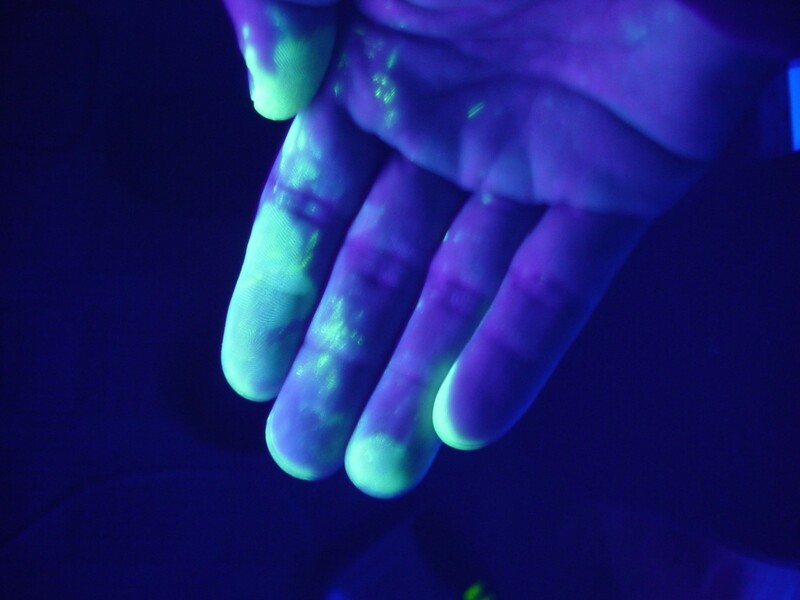 Any surface that is touched is most likely contaminated, and our cleaners don’t take any chances. Everything that’s within reached is meticulously sanitized, giving your whole toilet a clean and hygienic feel. Finally, the walls and floor are cleaned with chlorine, and the air is sprayed, making sure that the environment is hostile to germs and that any lingering viruses are killed. It may smell a little immediately after each cleaning, but much better safe than sorry. Depending on how many people use your office toilet, and how careful you want to be, you should have it cleaned minimum twice a day, often three, four, or even more times as needed. Once a day is probably just right for your toilet at home that isn’t publicly shared, and your office toilet is definitely not half as clean or safe. Here are some tips to help you clean your toilet at home, but do note that professional attention is still highly recommended for public toilets, including those in your office. Our cleaners take your health and safety very seriously, and you can be assured that with us taking care of your office toilet, it’ll be as clean as it can get, keeping you healthy and your office hygienic and happy. Sign up for office cleaning today with OfficeCleanz!